The nights are growing noticeable darker these days and with the often heavy clouds and rain of the last weeks, I’m having to turn on the lights in my house at night once again. That might sound like a strange concept to anyone from further south, but really, for the whole summer, I don’t need to use any lighting at home. But those days are now over. 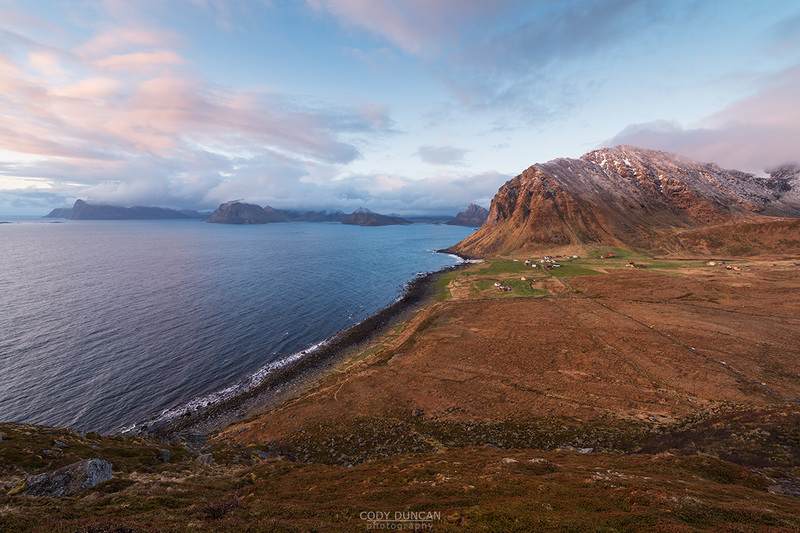 And with the first ‘autumn’ storm having passed over Lofoten last weekend, it is beginning to feel like summer is also over; and me complaining about it being too hot for a couple weeks in July just a distant memory. This week I even saw the first stars that I’ve seen in many months! 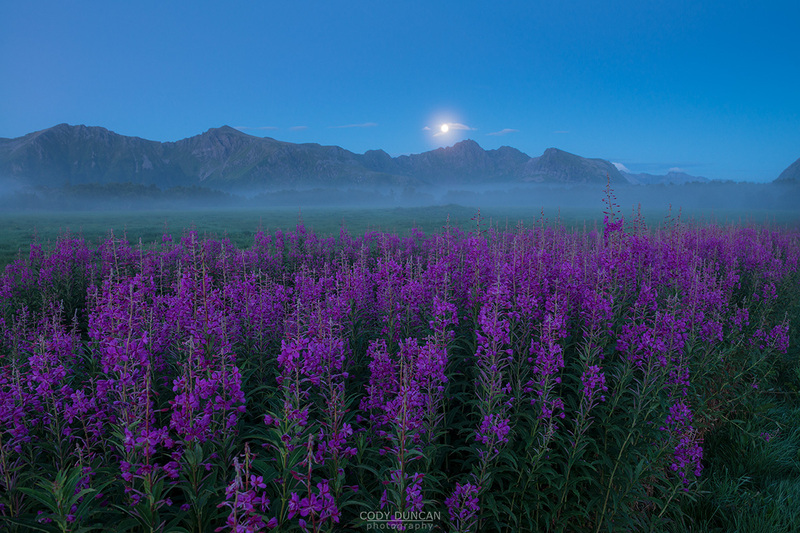 The landscape though, still filled with purple geitrams – fireweed, still holds onto summer as best it can. Even the weather might still give us another week or two of some warm temperatures if we are lucky. Otherwise, the thermometer seems to creep a little lower each week and it wont be too long until I pass by the first golden yellow birch leaf while wandering my way through the mountains – the sign that autumn has finally arrived. This photo is from last year’s twilight of summer photo workshop. We had been out on Gimsøy for the evening, slowly beginning the journey back to stamsund in the fading light when I noticed a bit of fog beginning to appear across the landscape. With the mostly full moon in the background, I liked the soft look of the landscape. Luckily the night and flowers were nearly perfectly still for a 3 second exposure due to the low light. After a little while longer the fog grew thicker and engulfed the landscape. It´s almost June! And with that it means the ferries from Bodø are filed with motor homes from the continent and the summer high season is about to begin. And for the mountains of Lofoten, this means this will be filled with hikers and campers. 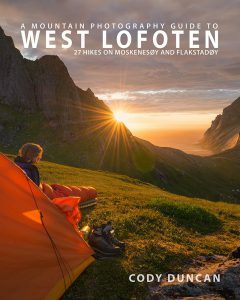 If the trends over the previous years are anything to go by, then Lofoten´s peaks will have more people on them this summer than ever before. 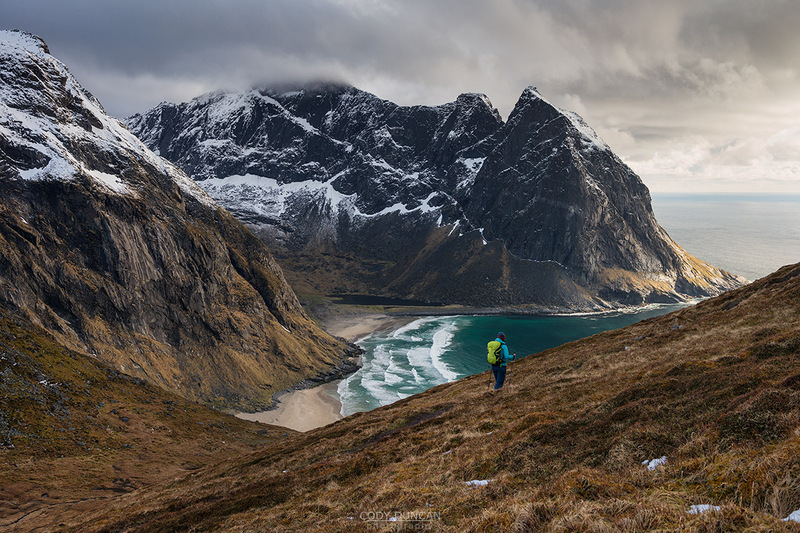 Lofoten is special, and that is probably why you are reading these words and planning a trip. 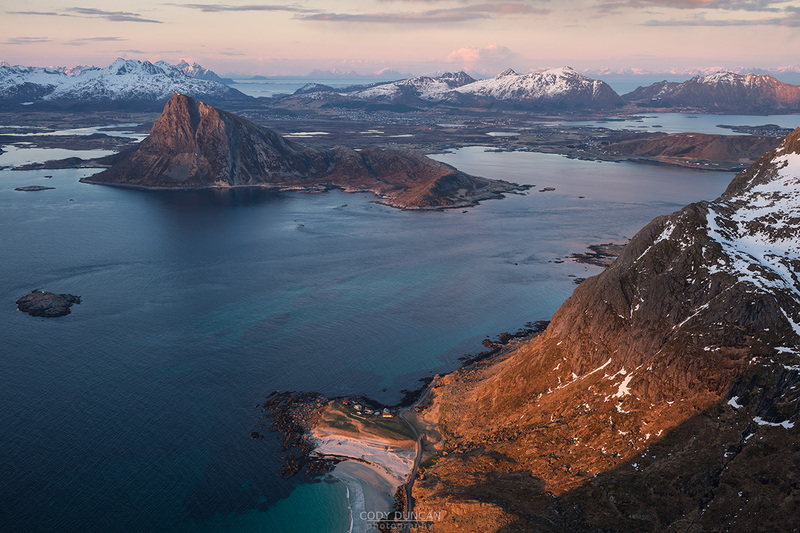 But Lofoten is also fragile. And in reality, the mountains can’t cope with their current rate of usage. The new Sherpa trail on Reinebrigen will still be under construction this summer, and the kommunne asks that people avoid the mountain. 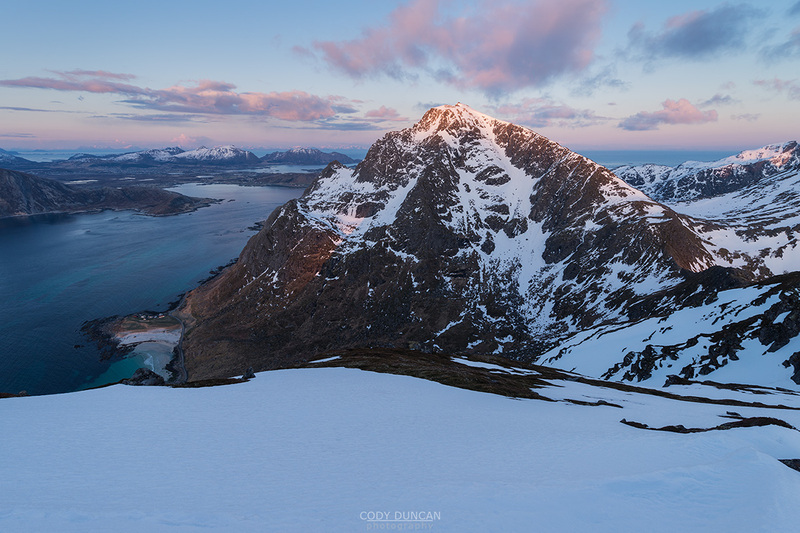 But no one really cares, and I’m sure new visitor records will be set this year on Lofoten´s most coveted mountain view. Please ask yourself, as your standing in a parking lot on a rainy July afternoon with near zero visibility: Does the mountain need your additional wear and erosion, which won’t even result in much, if any view? I’m not saying don’t go anywhere at all. 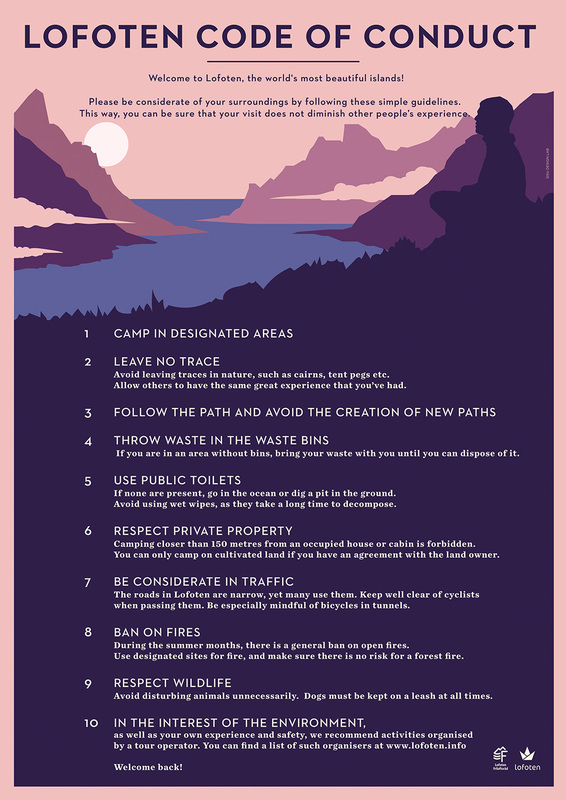 Just to be aware of conditions, and that your actions – and those of the 1000´s of other people, do have consequences and cause damage to this fragile landscape. This will be something Lofoten will have to discuss and find a solution to in the not to distant future. 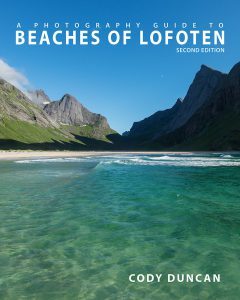 Before heading into the wilds of Lofoten download a copy of: LOFOTEN CODE OF CONDUCT. Be a good visitor to this place and try to avoid unnecessary impact on the environment so that those in the future can enjoy what you do today. With the snow line rising higher and higher up the mountains each day under the nearly 24 hours of daylight in late May, passing snow storms are still a common occurrence, even more so in the mountains. So don’t leave the down jacket at home yet! Actually, even in the height of summer, it´s a good idea to always carry an insulation later when out in the mountains, more so if you are unfamiliar with Lofoten´s weather patterns. 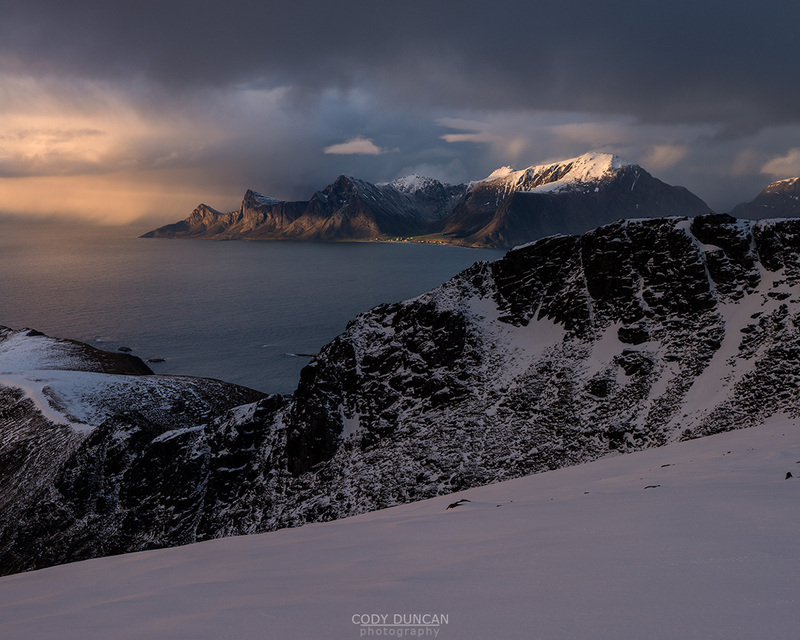 And while I generally find May a slightly boring month on Lofoten, these late season snow storms do provide the potential for some dramatic light, especially if they are in the late evening. This particular evening on Ryten actually started out quite calm and peaceful – one of the lakes was even still enough for some nice reflections while on the way up. As is Normal for Lofoten, things quickly changed and soon there was sideways blowing snow shortly after reaching the top. Soon the clouds pass and the summit is clear again, with the next waves of snow glowing in the evening light as they approach from the distance. May is the month were the snow melts, the midnight sun arrives, the trees turn green, and the islands prepare for summer. It is also a month, like November, that I mostly stay out of the mountains and seek out other activities. I find it a weird transition, no longer winter while not quite summer. And to tell the truth, I don’t really find the brown grass, tired looking and matted from snow, to be all that scenic, especially in the higher mountains. So I take May as a bit of a rest month, so rest the legs and save them for summer´s green mountains and fields of flowers. Alternately, it is also a good month to travel and leave Lofoten. And so while I wrote these words back in April, I’m currently sitting somewhere in Scotland – or better yet, heading out into the mountains somewhere. In 2017 I didn’t leave Norway (unless Svalbard technically counts) and was only off Lofoten for a few weeks total. I just kinda got stuck, which isn’t bad. But for someone who traveled more or less non-stop for 10 years, it is an abrupt change. 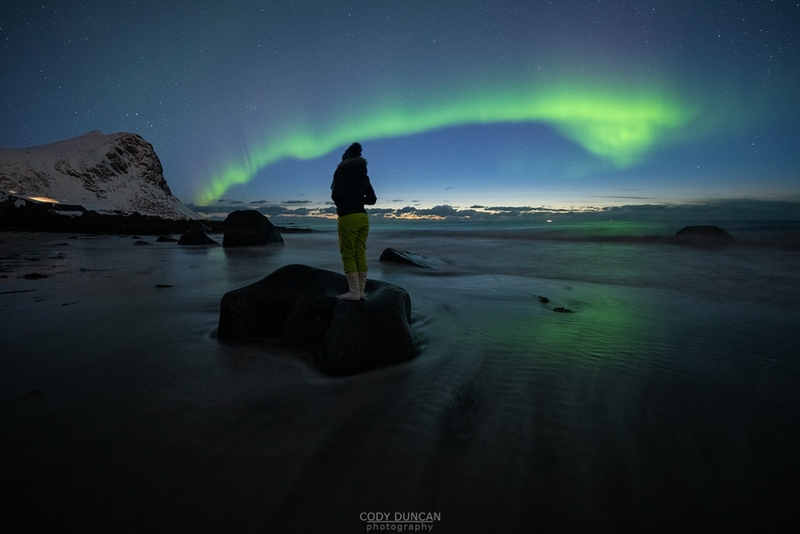 And while I love Lofoten and am nowhere close to getting bored yet, I’m actually afraid if I leave that I´ll miss something really cool that happens, I can recognize that I need to get away a bit, sometimes. And so why not Scotland, one of the only places with possibly worse weather than here! 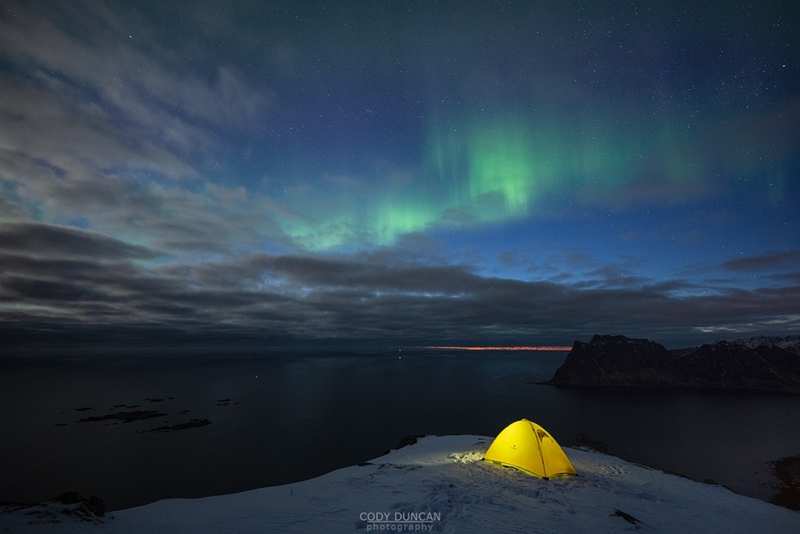 A cold north wind has been blowing across Lofoten during the last week. And while the summer sun has arrived on the islands, summer temperatures seem far away! Fresh snow has fallen across the mountains on several days, and while somewhat normal, it has been a colder than average May here in the north. And I just read that some areas of 3x the amount of snow than normal right now. Perhaps I should pull out the skis and head back to the mountains! Often I watch the nice light and dramatic clouds outside my window during the evening, thinking to myself that I should head out to the mountains, until I remember the work I still need to do, and continue typing away on the computer. But the other day, I finally succumbed to the temptation and went for a quick sprint up Hornet. Unfortunately, I waited a little too long, and a lay of clouds ate the sun before I reached the summit. I did manage a coupe images of the soft light shining over the valley, but nothing much compared to what I would have seen if I left an hour earlier. But with this my new backyard, I think I will have plenty of chances for something special in the next years. 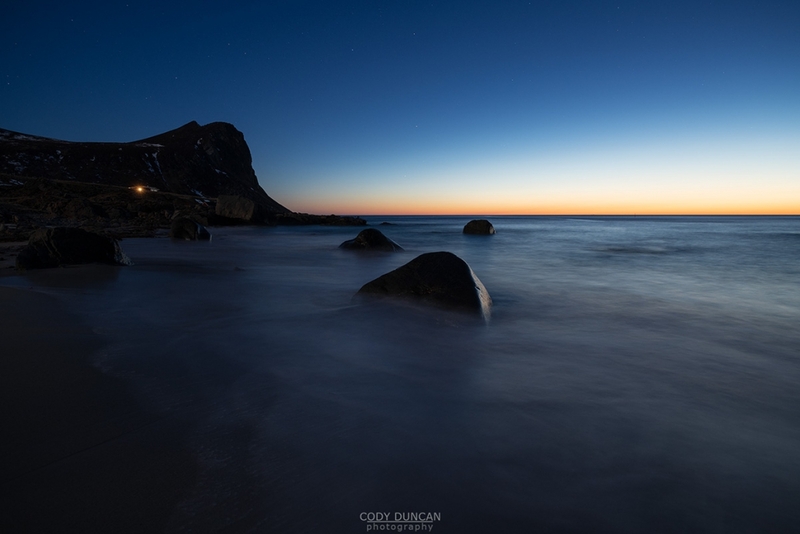 In a few more days the midnight sun will arrive on Lofoten. And by midnight sun, I mean that the sun will not sink below the horizon. Which isn’t really at midnight either, but closer to 01:00, due to daylight savings time. But I guess midnight sun sounds more romantic than one-o’clock-in-the-morning-sun. I always find spring to be a bit of a strange time of year for the senses. Or more specifically, the days and light are what I associate with summer, but the temperatures, especially this May on Lofoten, are closer to what I think of as winter. So I just need to make sure to brink my big jacket if I plan on sitting around the mountains all night long. This evening had a layer of light clouds over the northern sky. Something that I normally hate during the day, as it causes a flat, boring light. But with the sun low on the horizon, it was just strong enough to for some nice, warm light to shine across the mountains. 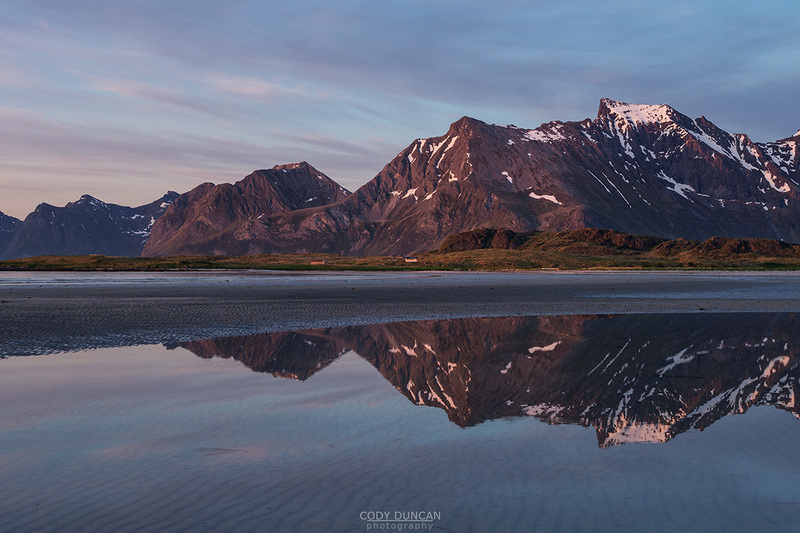 At low tide, Ytresand beach has the potential for some nice reflections, and being just down the road from my house in Skjelfjord at the time, it was an easy location to get to for a quick photo or two. The mountains of Stortind (right) and Moltind (center-ish) form the dramatic ridgeline on central Flakstadøy. The midnight sun is little more than a week away now, but I have already begun the transition to ‘night’ hiking. Though on off days, it feels a bit weird to stay up until 03:00 and wake up just before noon or so. Makes me feel like I’ve been out partying all night and then am waisting half the day, but I think I’m adjusting better than last year. Slettind is now one of my ‘backyard’ mountains. Though there is no trail, a relatively easy grassy slope leads you up to the ridge at around 480 meters. Then some sheep trails and a few rock steps continue the way up to the 569 meter high summit. I have a feeling this will be a place I visit quite frequently, as the views are incredible. Under the long hours of sunlight the snow is quickly melting out and the islands are beginning to turn green, though this year seems a bit on the late side, as temperatures have remained on the cooler side for much of May. However, in the mountains, it can still be full winter, and if you are planning on hiking anything inland or at elevation during the next few weeks, then you need to be prepared for winter hiking, not casual trail walking. You can see the coastal side of Stornappstind is mostly melted out, while the high valley on the right side is still carrying a lot of snow. And the remaining snow is likely deeper area, while the shallow stuff covering rocks will be what has melted out first. And another warning about rockfall. This is a dangerous time of year on Lofoten. Each time I drive the road to Leknes, there are new stones, and some of them quite large, which have fallen from the mountains above.